Sewage sludge is treated to make it safe for agricultural application. 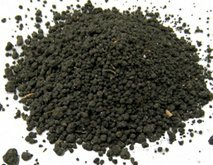 Treated sewage sludge produces nutrient-rich biosolids, which are principally used as soil fertilizer. Biosolids and the dried untreated form of sewage sludge are also used as alternative fuels. They are usually co-fired with other fuels like coal, municipal solid waste, wood waste, and agricultural waste. Not all sewage sludge, however, can be incinerated to produce energy. The water content and high levels of inert materials in sludge make its net fuel value relatively low. The Western Climate Initiative considers dried sewage sludge as a waste-derived fuel. As such, operators of general stationary combustion units using sewage sludge as fuel are required to measure the biogenic carbon content of their emissions using ASTM D6866. Like other waste-derived fuels, sewage sludge is not 100% biomass. Shampoos, detergents, and other substances derived from fossil fuels that are present in domestic waste make sewage sludge a heterogeneous fuel. ISO/IEC 17025:2005-accredited Beta Analytic in Miami, Florida, provides ASTM D6866 testing to companies that incinerate 100% sludge or co-fires it with other materials. Test results can be accessed by clients online via a secured page. Beta Analytic’s recommended sewage sludge sample size can be found here.